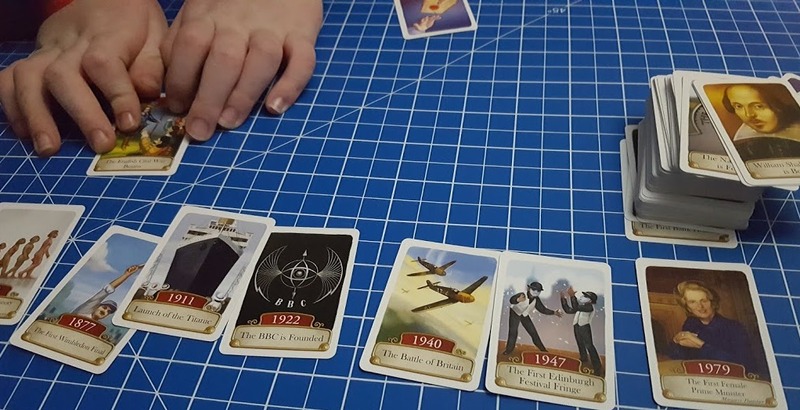 Timeline is a fantastic series of card games from Asmodee. Suitable for anyone aged around 8+, the aim of the game is for 2-8 players to put the events shown on the cards into correct date order. It may be history, but don't let that put you off, this can be a quick-paced game and children are often as good at making guesses as adults are! I love the Timeline games, and we've been sent the newest edition in the series for review - Timeline British History. Also available are Inventions, Science & Discoveries, Historical Events, General Interest, Music & Cinema and Star Wars. 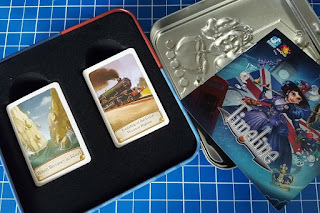 One of the features of Asmodee games is that they care about what happens when you've finished playing, and Timeline games are stored in their own beautiful metal tin. Not only attractive to look at, they are compact for travelling and taking to friend's houses, and will outlast the cards, unlike a cardboard box. The cards range from pre-history and the formation of the British Isles, right up until the present day and the Brexit vote. With 110 cards no major historical event is missed, and it's astounding how many were familiar to even my 6 year old. You find that most times you guesstimate, using clues with what you know from History, or clothing or how people lived, and then The Great Fire Of London or the Manchester Commonwealth Games come along and everyone knows the exact year. Gameplay is really very simple and easy to get the hang of. 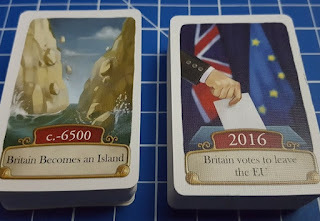 Each card has 2 sides - one is dated and one is not. At the beginning of a round each player is dealt 4 cards, and in turn players place their cards where they believe they belong in the timeline, turning them over to see if they are correct. If they are wrong they need to take another card from the stack. The winner is the first player holding no cards. 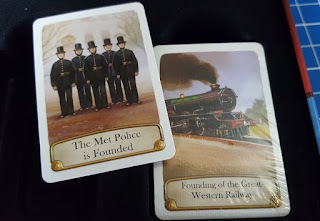 My family really enjoyed playing Timeline British History. Each round only takes about 10 minutes, so it's actually a handy card game to fill 20 minutes, and quite stunning just how quickly you start to remember the order of some key moments in history - including things like Women being allowed to vote, or the introduction of potatoes! 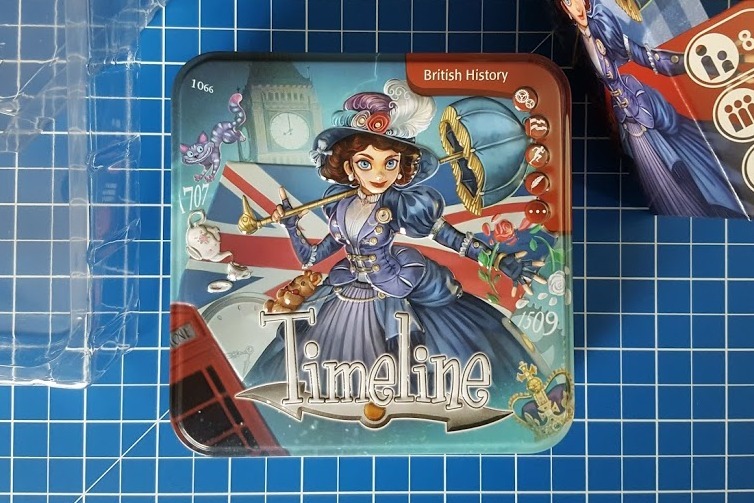 Timeline British History is made by Asmodee and distributed by Esdevium Games. The rrp is £13.99 and it is available from all good game and toy stores including online from Amazon. 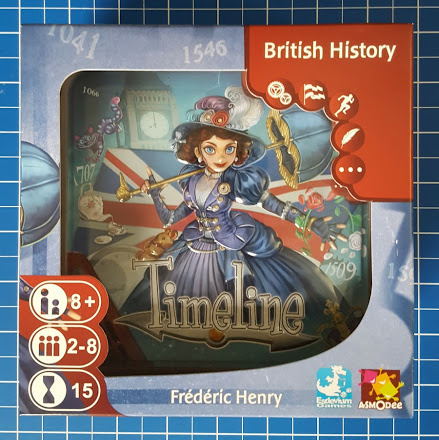 Esdevium Games have very kindly offered a copy of Timeline British History for one of my readers. 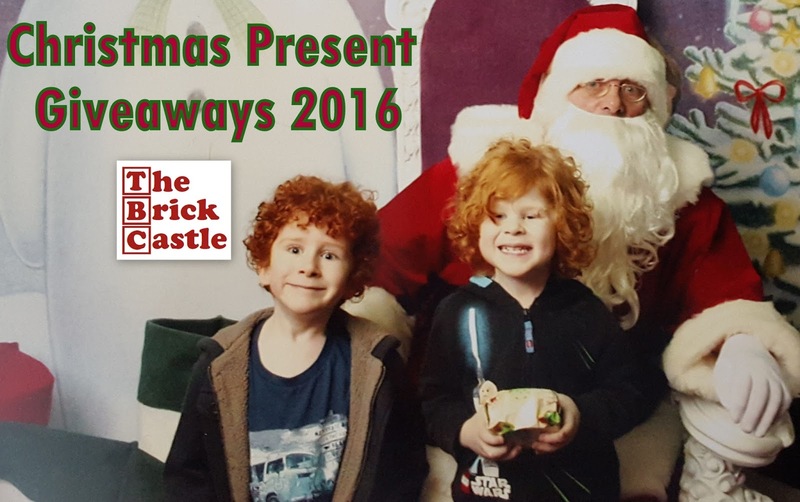 Entry to the giveaway is by Gleam form below and they will try their best to get your game to you in time for Christmas. Sinking of the titanic. Man though he was infallible, he was wrong. The coronation of Queen Elizabeth II .... actually there are soooo so many !! That's a long time ago lol I think it would have to be WWII because it effected my family so much. The sinking of RMS Lancastria, WW2. My grandad was very lucky not to be aboard when it sank. The Perkin Warbeck mystery- was he really who he claimed to be? Definitely the moon landing and Neil Armstrong's 'One small step for man, one giant leap for mankind' legendary event! Any thing to do with Henry VIII. I would have to pick the queens coronation as i would have personally loved to have seen that. The execution of Oliver Cromwell - nasty man - got rid of Christmas fun. I would include the Battle of Britain in 1940. I would include the 1948 founding of the NHS. It features very heavily in our family and my Dad (now retired), Husband and myself all work in local NHS services. The first ascent of Everest by Edmund Hillary. The wars of the roses. Love Tudor history!